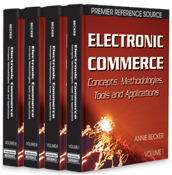 Electronic commerce on the Internet has been discussed in literature as an interorganizational information system that can provide a strategic advantage via customer loyalty to small and medium-sized enterprises (SMEs). However, that is not always true, because many SMEs have difficulties achieving the benefits, as suggested by media and early research. This study is an empirical examination of the impact of the Internet’s Web tools on the interorganizational relationships (IOR) between SMEs and their loyal customers. Data collected from 386 SMEs in North America (United States and Canada) and processed with Partial Least Square (PLS) show that the use of Web tools (i.e., the level of Web content and the level of security on the Internet) has a positive impact on the relation between cooperation and interdependence, and customer loyalty. However, the impact of the Internet’s Web tools on the relation between trust and customer loyalty is different, because the use of nonsecure Web tools reduces the impact of trust on customer loyalty, and surprisingly, the use of secure Web tools doesn’t increase or decrease the impact of trust on customer loyalty. The implications of the results of the study are discussed.